While New England has been spinning its wheels with the ball this season, Bill Belichick's men aren't showing any signs of worry, writes Mike Lowe. FOXBOROUGH, Mass. — If the New England Patriots are feeling any desperation in the way their offense is operating after three games — and they should — they’re not showing it. Once one of the NFL’s most efficient offensive machines, the Patriots have been spinning their wheels much of this season. Entering Monday night’s game against the Kansas City Chiefs at Arrowhead Stadium, the Patriots are ranked 26th in total offense with just 301.3 yards per game. That includes 196.3 yards passing, good — or bad – enough for 27th in the league. To put that into perspective, the last time the Patriots averaged that little offense was in 2001, when Tom Brady first took over the starting job from Drew Bledsoe and led New England to its first Super Bowl championship. The Patriots averaged only 305.1 total yards per game that season when Brady’s primary task was simply not to lose the game. More is expected of Brady and the Patriots these days. Bill Belichick will tell you ad nauseum that the only statistic that matters is on the scoreboard. He even brought that up after Sunday’s 16-9 snoozer over the Oakland Raiders. “Points is what this game is about, on both sides of the ball,” he said. But even in points, the Patriots are coming up short this year, averaging just 22 per game, tied for 14th in the league. Of course, we’ve only played three games. And that’s why the Patriots aren’t fretting. They have a history of improving as the season progresses. At this time last year, they were averaging only 19.7 points per game and the passing game was averaging only 217.7 yards. That the Patriots were 3-0 at this point in 2013, as opposed to 2-1 this year, probably bought some time for the offense to develop. And it did come around. By the end of the 2013 season, the Patriots were averaging 27.8 points (third in the league) and 255.4 passing yards (10th) per game. This year, fans aren’t going to be as patient. That was evident very early in Sunday’s game when boos cascaded down from the faithful in Gillette Stadium after a couple of particularly ineffective offensive series. So what’s the problem? Or should we say problems? Even Belichick knows the offensive issues run deep. n Brady has to make better decisions. His completion rate is up minimally from last year at this time (58.5 percent now, 57.5 percent then) but almost half of his throws have been to two receivers: Julian Edelman (the only offensive player competing at anything close to his capabilities) and Rob Gronkowski (who is still winding his way back from knee surgery). He needs to get more receivers involved in the offense. Otherwise, teams will find ways to take away his most trusted outlets. n The running game has to take pressure off the passing game. 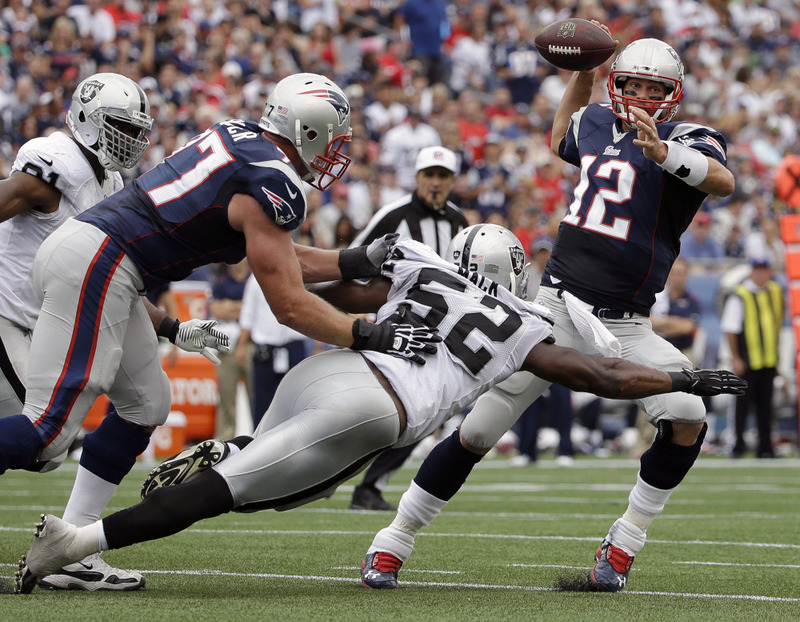 The Patriots are averaging 3.5 yards per carry, which is all right, but not spectacular. Even that is skewed by Edelman’s 8.8 yards per rush. The Patriots are especially having problems in short-yardage situations, which is another sign of issues on the offensive line. n The Patriots have stumbled on third down. In 2013, they had converted 21 of 53 third-down opportunities (39.6 percent). This year they have converted 19 of 49, or 38.8 percent. Maybe that doesn’t seem like much, but that’s how drives stall. n New England has to do better on first and second down as well. On third down, the Patriots face an average of 7.71 yards to convert a first down, according to the folks at Pro-Football-Reference.com. That’s eighth-worst in the league. Consider that in 2011, New England finished the year with a league-best 6.18 yards to go on third down. n The Patriots have got to do better in the red zone, that area inside the 20-yard line. They’ve made 10 trips into the red zone and have scored only five touchdowns, putting them in a tie for 17th in the league. Conversely, Atlanta leads the NFL, scoring seven touchdowns on eight red-zone possessions. The Patriots’ troubles in close were highlighted in Sunday’s game when they had four trips into the red zone and came up with only one touchdown and three field goals. One trip included a first-and-goal from inside the 2. “You just can’t do that,” Brady said after the game. Brady knows the offense has to get better. If it doesn’t, he knows what can happen. And that would become the biggest problem of all.